Dave Roberts from Shaver Chicks brings baby chicks to show the kids. 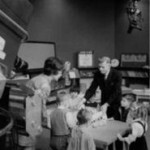 Romper Room was a daily half-hour program for pre-school children that CKCO licensed in the early 60s. 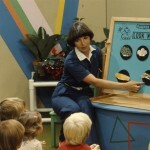 Romper Room was franchised instead of syndicated, so local stations could produce their own versions. The first host on the CKCO produced show in 1963 was Miss ?? (name needed. She was imported from the US by Bert Claster) followed by Miss Wanda (Kanten), Miss Grace (Lawson)196?-1972, Miss Betty (Thompson) 72-74, Miss Cathie (Sackville) 74-75, Miss Diane (Ippersiel) 76-78, and then finally Miss Fran (Pappert) 78-92. 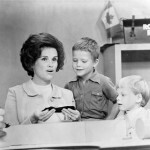 Miss Fran was the longest-serving Romper Room teacher in North America. An invited group of children took part in each show, which had several regular features including Doo-Bee, Paddington Bear, the Magic Mirror and Doc, whose main concerns were health and safety regulations for children. Basic physical activity to encourage an active lifestyle and the maintenance of good health was a regular part of the program. In 1972, CKCO-TV took responsibility for producing the series for all CTV affiliates across Canada. 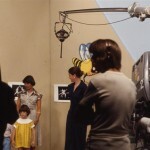 In 1981 the series became known as Romper Room and Friends and was cancelled in 1992 because CTV did not renew its contract At that time, the CKCO produced Canadian Romper Room was the only version still in production in the world.